Learn how to manage Cuisine Types in YooRecipe. Fill in form and save. Note: Cuisine type code must be one word (no spaces). Once your cuisine type has been created, NS Recipe needs a label to correctly translate your new Cuisine Type. This process is required to make it work on all sites, multi-language or not. Set filter to back-end (NS Recipes uses back-end labels in front-end) and click "New." 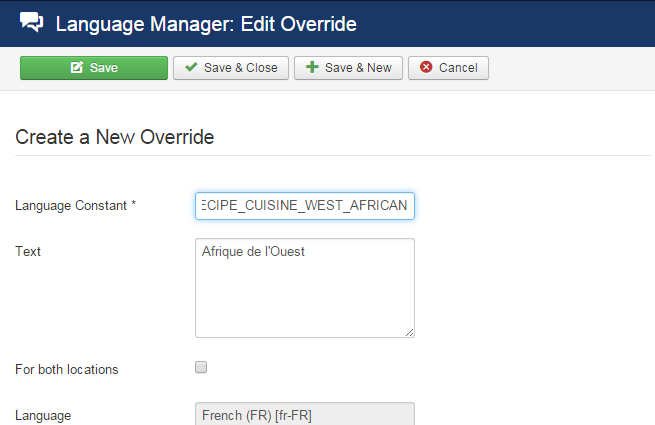 Create a new label (here COM_NSRECIPE_CUISINE_WEST_AFRICAN) and give it a translation. Check the "for both locations" checkbox so that label is defined for front-end and back-end. Click save and repeat this steps for all your active languages.